(MoneyWatch) Americans who dream of a retirement filled with sandy beaches, temperate weather and colorful local life may have another thing coming. That's because a new report from the National Institute on Retirement Security finds that 45 percent of working-age households have no retirement savings at all. The average figure for funds set aside by households nearing the end of their working lives was a meager $12,000. That's not enough to cover a single year. If there is no change in their savings rate, many Americans may wind up living on monthly Social Security benefits alone. Monthly benefits now average just $1,262 -- an amount that doesn't cover housing costs in most retirement hot spots in the U.S. But it is possible to retire with nothing more Social Security benefits if you do so outside the U.S. In some of the most affordable, but still appealing, cities in the world, an expat can live on just $1,250 per month. Live and Invest Overseas, a publication and research firm specializing in overseas living, found six places where Americans could live well on the cheap. The company's Retire Overseas index uses 12 factors, including climate, whether English is spoken, cost of living, health care and infrastructure, to determine the best cities to retire. In any of the six Asian and Latin American cities the index dubs most affordable, retirees can live in luxury -- and without breaking the bank. In these cities, $1,250 is enough to cover all your living expenses, from housing to dining to travel. Cebu, a developed province in the Philippines, has some of the most beautiful natural landscapes in the world: narrow coastlines with bright blue waters and limestone plateaus offset by rolling hills and rugged mountains. Cebu is home to Mactan-Cebu International Airport, from which it is easy for retirees to fly back to U.S. And Mactan-Cebu makes it just as easy for family and friends to fly in for a visit. The cost of living here is extremely low, so your dollar goes four times as far. To top it off, the Philippines offers generous residency visas for retirees. 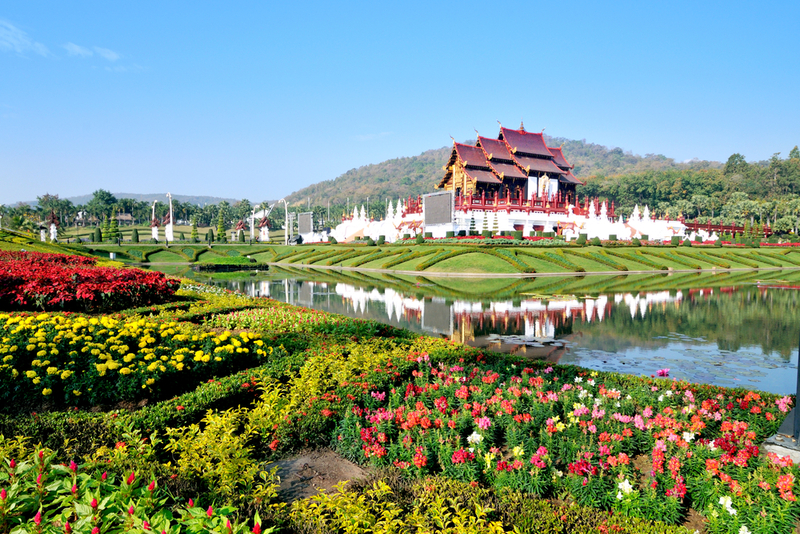 Chiang Mai is a historic city located along the Ping River, nestled within some of Thailand's tallest mountains, which are dotted with Buddhist temples. The city hosts several festivals, including Loi Krathong, where residents launch decorative lanterns whose heat sends them skyward, and the Flower Festival, which takes place when the city's tropical flowers are in full bloom. Chiang Mai bustles with unique cafes and markets but quiets down once you step outside the city center. It's an extremely affordable place to live, with monthly expenses clocking in at under $1,000 a month. Large homes in gated communities in this city cost a fraction of their American counterparts. Many retirees live here; you can see an English-speaking doctor in Chiang Mai for as little as $20. The Chiang Mai Expats Club, with 650 members, is one of the best ways to become acquainted with the city and tap the knowledge of retirees already living in the area. Cuenca is located just outside the El Cajas National Park, where the snowy peaks of rugged mountains rise up above mirrored lakes. UNESCO has designated the city a World Heritage Site, a distinction granted because of beautiful historical landmarks that include cathedrals, museums and parks. It a has distinctly European vibe reminiscent of Barcelona and Paris, and for American expats may bring to mind San Francisco. Cuenca's beautiful natural setting and ideal climate -- temperatures average in the mid-70s year-round -- have attracted expats for years. The cost of living is low, and the city's school, health care and political systems are well run. Granada has rapidly developed into a tourism hub, thanks to the city's preservation of its colonial-era architecture. Americans and Europeans have been snapping up homes for some time. The city may be the cheapest place in the world to retire and live well. A couple can enjoy sunsets over its red tile roofs and marvel at its blue-and-white church steeples for less than $800 a month. Granada sits on the edge of Lake Nicaragua near the dormant volcano Mombacho. The expat community in this naturally beautiful setting is very close-knit, and English is spoken by almost everyone who lives and works in town. Hoi An, also known as Faifo, sits on the coast of the South China Sea in Vietnam. Designated a World Heritage Site by UNESCO, its Ancient Town (from the French Vieille Ville) section is an incredibly well preserved example of a Southeast Asian trading port, transporting visitors to another time. The city's riverfront and marketplaces bustle with activity, but its tropical beaches are calm. Each month, the town trades its electric lights for traditional lanterns, lighting up the city in a colorful glow. Hoi An also has plenty of pedestrian streets, where residents and visitors can wander around the busy and brightly colored markets. Medellin is the biggest city on the list, and that is reflected by the skyscrapers and glowing lights that sparkle in the hillsides at night. While Medellin struggled with crime and the drug trade in the 1980s, it is significantly safer now, and areas such as El Poblado record very little crime. Medellin was named the Most Innovative City of the Year in March by The Wall Street Journal and Citi, thanks in part to its advancements in public transportation, which include Metrocable, a gondola lift system with several lines, and escalators. There are beautiful natural parks throughout the countryside, among them nearby Guatape Lake and Parque Arvi Nature Reserve. The trip to Parque Arvi by Metrocable costs just $3, an indication of Medellin's low cost of living. The city also has five of the best hospitals in Central and South America.